Over the past 15 years of scouting and evaluating overseas properties, I’ve learned to look for each location’s “specialty.” That is, the one thing it does better than anywhere else… the thing that sets it apart from the competition. 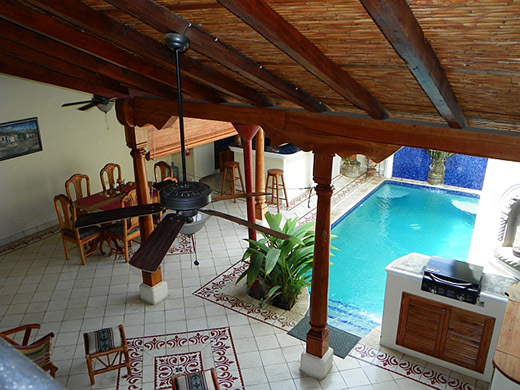 Granada, Nicaragua’s niche is the impressive inventory of Spanish colonial-style homes. If you’re not familiar with that architectural style, it’s the type of city dwelling that’s fairly plain on the outside with its rooms built around a center courtyard on the inside. It’s a style designed for an environment where the houses are built against one another with no room for an outside yard… hence the “yard” is inside the house, where it’s private, often lush, and open to some of the home’s living areas. If you haven’t seen a Spanish Colonial, here’s a beautiful example. After all this time spent actively looking, I haven’t found a better market for this type of home than Granada. What’s more, you can get in the door for less than US$60,000. Prices are very low, when compared with colonials elsewhere in Latin America. Completed homes are a great value, and fixer-uppers are downright cheap… with inexpensive remodeling costs. The homes in Granada tend to be smaller than in many cities, with one-story houses commonly available. This makes the houses brighter, with the single story allowing for more direct sunlight through the center courtyard. The relatively small size of many Granada colonials is due to the fact that most of them—over 90% of those on the market—were originally vacation homes for wealthy Nicaraguans, which were ultimately sold to expats and investors. Many houses here also have pools in their interior courtyards… something I haven’t seen in other colonial markets. Granada is completely walkable. Everything you need is close at hand, laid out on attractive, level streets. The fairly large expat community—along with an active tourist trade—brings Granada lots of amenities that a city of 120,000 would not ordinarily have. There are great restaurants, bakeries, hotels, and B&Bs that distinguish Granada from most cities of its size. Lake Nicaragua, with its beaches, fresh waters, and islands, provides a great recreational opportunity and a pleasant way to escape the heat. It’s also great for boating and fishing, with a huge 3,100 square miles to explore. Granada enjoys good connections to the U.S. from the nearby airport in Managua. But best of all, Granada still feels very authentic… Nicaraguan. You’ll see the old ox carts lumbering through the streets alongside the towering cathedral, as well as the local delicacies, crafts, and pottery offered by Granada’s street vendors around the square. 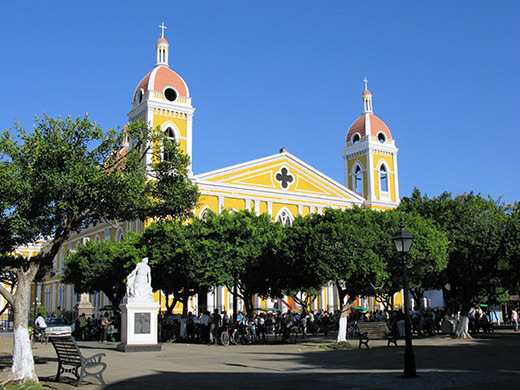 Granada offers a unique blend of native Nicaraguan city life and expat amenities. Founded in 1524, Granada claims to be the first European city founded in mainland America… so it’s a truly old colonial city rather than a semi-modern lookalike. It’s named after the ancient city of Granada, Spain, and shares some of that city’s Moorish architectural influence. 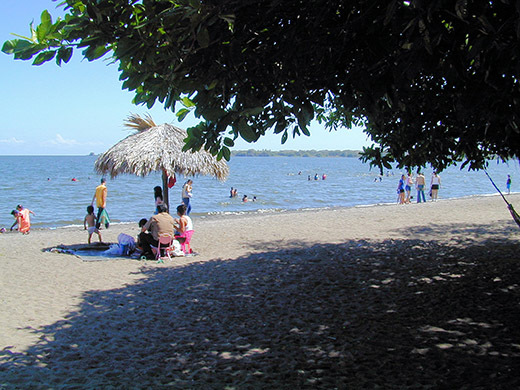 Granada sits at the north end of Lake Nicaragua with beaches within walking distance of town. Just offshore, you’ll find a group of small private islands called Las Isletas… several of which are for sale. 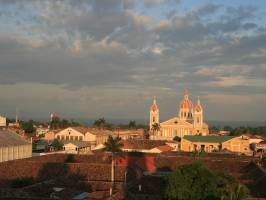 Granada also lies just south of the well-known Lake Apoyo, Nicaragua’s largest volcanic crater lake. Here too, you’ll find properties for sale overlooking the lake from the rim of the extinct volcano. The international airport at Managua is just under an hour to the north, and the Pacific Ocean lies just over an hour to the west. The weather is warm-to-hot all year with average high temperatures running seasonally between 86 and 93 degrees (30 to 34 degrees Celsius). Rainfall is moderate at 47 inches, although most of that rain comes between May and October in the form of afternoon showers. It’ll be obvious as soon as you arrive: Granada is one of most finely restored and preserved colonial cities out there. It sees a good number of international travelers and has a sizeable expat community… both of which account for its wealth of hotels, fine restaurants, and well-kept buildings. Granada is built around a large, shady, and bustling town square, anchored by the stately, neoclassical cathedral at one end. The streets are narrow—built prior to the automobile—and lined with rows of cheerful, neat Spanish homes. The rental market is good in Granada, especially if you have a pool. Occupancies in prime locations can run between 65% and 75%. If you have a small home near the central plaza, a 70% occupancy will result in a gross return of about 14% based on prices I’m getting today for weekly rates. The farther you get from the town plaza and the larger the home, the smaller the return will be. One downside to Granada is that it can be hot. I didn’t really find it unpleasant, but I did sleep with the air conditioner, as will most people. Also, if you want to be a pioneer—one of the first few expats to discover a city—then this isn’t the place to do it. The expat community is not that big (and has brought some nice amenities) but there are definitely a fair number of English-speakers already in residence. I’m always surprised that prices here have not inflated like they have in most markets where colonial homes are available. As you’ll see, things are still quite reasonable. I find that this market is not very liquid, though. So don’t buy a home thinking you’re going to flip it quickly to make a fast buck unless you’re buying something really special or undervalued. A sound three-bedroom fixer-upper in the historic center will start at around US$59,000. This house shows horribly, with lots of junk thrown around… but it’s a pretty good value given its location and structure. With Nicaragua’s low labor rates, this is a great country for restoration. Casa Rañita is located just one block from Calle Calzada with its restaurants, shops, bars, and cafes. The real estate agent suggested installing a small pool in this one and I agree—this could be a high-performing rental with a pool. It has two bedrooms, two baths, and a small interior patio. The asking price is US$85,000. This one is a terrific value. It’s a completely restored, completely furnished Spanish colonial that not only has an interior patio, but also a pool and indoor parking. The house has three bedrooms and three bathrooms (and each bedroom has its own en suite bath). The name of the house is Casa de Arcos, named for the 20 arches found throughout the home. The owner has taken great care of it. Located just a few minutes’ walk from the central plaza, his asking price is US$169,000. Have a look at Casa de Arcos here. Here’s a good deal if you’d like to tap into Granada’s tourist trade. It’s a hotel with six bedrooms and bathrooms and a beautiful interior courtyard. It’s well located in the historic center, within easy walking distance to the central plaza and the famous Calle La Calzada. The asking price is US$250,000. If you’d prefer life in a planned community, check out Club Vistalagos. It offers breathtaking views of Lake Apoyo, it’s just a few minutes from town, and it offers the security and privacy appreciated by many part-time homeowners. I’ve owned a property here myself, since 2005. Follow the link to get more information on Club Vistalagos. My real estate contact in Granada is Michael Martinez. You can write to Michael here. Nicaragua offers one of the world’s largest lakes… a pristine Caribbean coastline… beautiful Caribbean islands… cool mountains… and hundreds of miles of sandy Pacific beaches. Nicaragua and its people convey a welcoming feeling—a comfortable feeling—that I don’t quite find anywhere else. No matter how many times I go, I look forward to getting there and I’m sorry to leave. If you’d like to invest in Spanish colonial property or would enjoy the Spanish-American lifestyle, then Granada should be high on your list. Located less than a two-hour flight from Miami, the cost of living is low, the properties are inexpensive, and the inventory of colonial-style homes is unparalleled—especially at these prices. The Live and Invest in Nicaragua Conference will be held on Nov. 2, 2015. The Early Bird Discount for this event expired last week. But since Overseas Property Alert is only published weekly, Lief Simon has agreed to extend the promotion so that anyone responding to this newsletter will be granted the US$200 discount. Please tell customer service that you’re a reader of Overseas Property Alert to make sure they give you the discount. You can read more about the Nicaragua Conference here. Thanks for the Aussie article. My son and his family live in Perth. I always thought Australia was unfriendly towards retirees. Now I’ll have to rethink it. Are Americans allowed to buy in New Zealand and, if they do, how long can they stay at a time? The catch is residency for retirees. NZ welcomes productive working people who will contribute as an immigrant… but it’s difficult to get residency as a pensioner. Thresholds are high and options are few. We’ve been spoiled by Latin American countries that go out of their way to attract foreign retirees. But it’s perfect as a part-time residence. As a U.S. or Canadian citizen, you can stay 3 months per visit (extensions are possible), to a maximum of 6 months out of any 12-month period. UK residents can stay six months right off the bat. 1. Is crime in Medellín under control for a large city and is it a good place to retire? A Colombian friend of my son told him it’s still “pretty bad” there. Not true, I hope. 2. Also, in Medellín is there a fair amount of “senior” expats there? I get the feeling perhaps the expat community is very young. Is Cuenca a better destination for expat seniors because of the larger expat numbers there? When it comes to life in Medellín, I’ve been guilty of generalizing. That is, I speak of Medellín as if each part of it were the same, which is not the case. When most of us at Live and Invest Overseas write about “Medellín” we’re really writing about a few neighborhoods where expats tend to live. Places like El Poblado and Laureles, and the neighboring communities of Envigado and Sabaneta, among others. These places are very safe. In El Poblado, we walk the streets all hours of the day and night and my wife and her female friends are comfortable walking home after a night out. But not all parts of Medellín are the same. In fact, there are areas that are unsafe at all hours of the day. As to senior expats, yes… there are quite a few. In fact (in my experience) the North American expat community was dominated by people over 50 until just a few years ago. It’s been only since 2010 or so that I’ve seen larger numbers of younger expats moving down. The difference between Medellín and Cuenca however, is not the age of the expats but the number. Cuenca has far more expats per capita than Medellín does. Lee has been living overseas for nearly two decades, making his first purchase abroad in the colonial city of Cuenca, Ecuador. He's traveled extensively across Latin America and Europe looking for the best property deals possible. Lee’s network of property insiders from those travels, along with his understanding of local cultures and languages, has helped him develop insight into local property markets that only the locals usually possess. He offers overseas real estate advice as a contributor to Overseas Property Alert.